Aerial view of the Roan Plateau surface on the wild side of the plateau, near Rifle, Colorado. Aerial support provided by LightHawk. The Roan Plateau is such an extraordinary place, a jewel in Colorado and until now, one the most imperiled places in the West. It’s a big part of the reason that I started working in the sagebrush ecosytem when I was trying to reckon with the impact of energy development sweeping the West at the start of the fracking boom. Today, the wild side of the Roan is no longer imperiled. 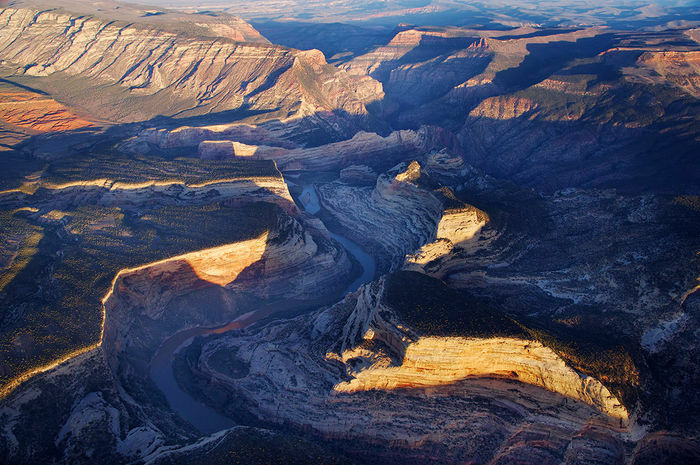 A compromise announced yesterday ended a protracted dispute, a triangle of energy developers, conservationists, and the Department of the Interior. For this moment, we can forget about mistakes that led to gas leases sold for development on the surface of this unique and special landscape and just celebrate the spirit of collaboration and resulting good outcome that keeps the West a little wilder. The Wilderness Society, Conservation Colorado, and others led the opposition to drilling the Roan, and many regular folks added their voices, reaching a pitch that couldn’t be ignored. It’s a great day for Colorado and the American West. Posted in Colorado, Energy, Sagebrush Sea on November 25, 2014 by Dave Showalter. In a move that’s sure to rile up folks on all sides, today the US Fish and Wildlife Service designated the Gunnison Sage-grouse as Threatened under the Endangered Species Act. (by the way, that’s my image accompanying the article) Anyone close to the issue and knowledgeable of Gunnison Sage-grouse knows the bird is endangered – they are endangered on the IUCN Red List. But, before we go off and point fingers, claim injustice, and look for a villain, we should all take a collective deep breath. It’s true that we lack the funds to manage Endangered Species as intended when the Endangered Species Act was passed in 1973, and it’s true the bird is endangered, but what would a listing do to improve the situation? Gunnison is different. The entire extended community has pulled together to conserve habitat and save the species. Colorado Parks and Wildlife is leading a Rangewide Conservation Plan that has widespread community support and is the benchmark for western communities. The good people of Gunnison have seen this coming for two decades and have worked hard to recover their namesake bird. 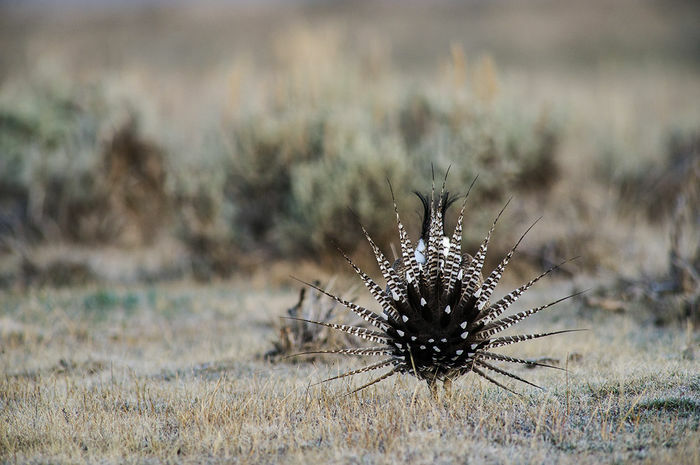 The new decision gives Gunnnison Sage-grouse some protection – let’s wait and see how the critical habitat piece affects ranching and recreation. Posted in Colorado, Endangered Species on November 12, 2014 by Dave Showalter. Posted in Colorado, Endangered Species on May 9, 2014 May 9, 2014 by Dave Showalter. Aerial View of the Natural Gas Plant On Parachute Creek, near the town of Parachute, Colorado. There is an oil spill just below the plant. I made this image with the support of LightHawk. I remember flying over this massive industrial plant to photograph Two Sides Of The Roan and wondering what would happen if there was a spill. The plant is situated on Parachute Creek, which flows into the Colorado River. Rigs, plants, and compressor stations line both sides of the river in between Rifle and Parachute. A spill has happened – an estiimated 6,000 gallons of oil and 60,000 gallons of contaminated water have escaped and are leaching into the earth. From the Denver Post: “Oil company workers investigating a weeks-old spill along Parachute Creek are focused on a valve box on a pipeline carrying natural gas liquids away from the Williams Midstream gas plant, the Colorado Oil and Gas Conservation Commission said Tuesday.” The good news is that it’s not in the creek yet, but we don’t know how much has discharged, where it’s traveled to, what chemicals are leaking… At a time when Colorado is debating how close to site energy development to human development, and while our governor claims that the industry has proven they can extract oil and gas safely, this catastrophe suggests a more balanced discussion. Posted in Colorado, Energy on March 27, 2013 by Dave Showalter. The winter of 2007/2008 was harsh, even by Gunnison standards. Gunnison is often called the doughnut hole by locals because winter storms sit on surrounding mountain ridges; but that didn't happen in that particular winter. It snowed with no relief and ungulates sought hay bales to avoid starvation. Eventually, the Colorado Division of Wildlife fed deer and elk from the air. Hundreds of resident pronghorn died and have since been reintroduced to the Basin. 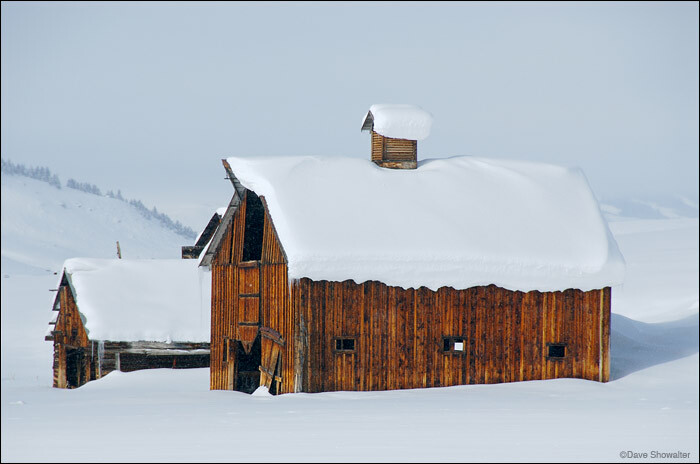 I made this image of the old barn near Parlin, a reminder of the heaviest snow cover I've ever seen. As another wimpy winter winds down, I’m feeling nostalgic for a full-on snow season. Posted in Colorado, From The Vault on February 28, 2013 by Dave Showalter. While in Gunnison last week, I took a walk at Neversink in the Curecanti NRA on a twelve below zero morning looking for photo possibilities along the Gunnison River. The river is a frozen trickle in mid-winter, with small patches of open water surrounded by a cottonwood gallery forest. It’s a vital riparian area, with woody vegetation to give birds and rabbits cover – a wildlife oasis in the sage. I like to check the holes in the cottonwoods for an owl or a flicker, sometimes a raccoon. There were deer, rabbit, and coyote tracks in the snow and these interesting patterns of ice crystals on the frozen river. I talked to Western State College University wildlife biologist and professor Pat Magee about the crystals that form when dry cold air pulls moisture from the ice. Pat explained that the process goes from gas to solid, skipping liquid altogether. The crystals disappear as the valley warms and will reform when conditions are right, darn cold and dry. Fascinating, don’t you think? Posted in Colorado, Sagebrush Sea on February 18, 2013 February 18, 2013 by Dave Showalter. Flowering rabbit brush lines a two lane road in the Thompson Divide area, near Carbondale, Colorado. This entire area is leased for natural gas development. Posted in Colorado, Energy, Politics on August 23, 2012 August 24, 2012 by Dave Showalter.